Rock band Genesis will perform their biggest concert ever with a free gig for more than 400,000 fans at an ancient hippodrome in Rome. The concert at the Circo Massimo on 14 July will be the final show of the band's first tour in 15 years. There will be no tickets, and people are being told to turn up on the day on a first come first served basis. Two tour dates in Austria and the Czech Republic have had to be rescheduled as a result of the Rome announcement. The concert in Linz, Austria at the Gugglestadium has been moved to 19 June, while the Prague concert in the Czech Republic at the Strahov football stadium will now take place on 20 June. All tickets will be honoured or refunded. The Circo Massimo has hosted many big events before, including Live8. 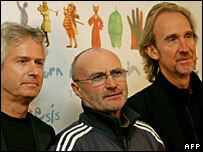 Tony Banks, Phil Collins and Mike Rutherford announced the Turn It On Again reunion tour last year, which will take in 12 countries. Former member Peter Gabriel will not be joining the tour. It begins on 11 June in Helsinki - over 800,000 tickets have been sold so far. The two UK dates take place on the 7 and 8 July at Old Trafford, Manchester and Twickenham, London.